Abstract—Idared apple cylinder of 20 mm diameter and of 15 mm length cut out from whole apple in radial direction. ECG (Fiab Spa) electrodes with contact surface of 10 mm diameter were connected to the bases of apple cylinder. Impedance spectra of apple cylinders under mechanical stress were measured with a HP 4284A precision LCR meter in frequency range from 30 Hz till 1 MHz at 1 V voltage. The constant deformations (from 0.1 mm till 1 mm by 0.1 mm steps) of sample or the constant forces (from 0.4 N to 4 N by 0.4 N steps) pressured the sample were adjusted with a probe cylinder (15 mm diameter) of a TA-XT2 texture analyzer. The direction of deformations and stresses was parallel with current way through the sample. 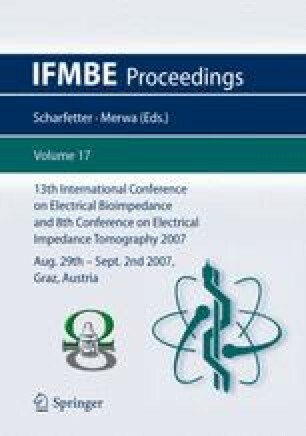 The real part of impedance decreased as the deformation, or the stress increased, and the imaginary part of impedance increased under increasing stress or deformation. A model consisting of a serial connection of a resistor and a distributed (Cole) element was used for fitting of each measured spectrum. The relatively large changes in model parameters during increasing stress can be explained not only with shorter sample length but with the change of specific resistance and relative electrical permittivity of apple tissue under stress, too.